Randy Devine, flushing Town Water System on July 22, 2002. Temperature was a mild 92 degrees. Randy was smiling because he had just mentioned that maybe I should take his picture with his head under the running water. 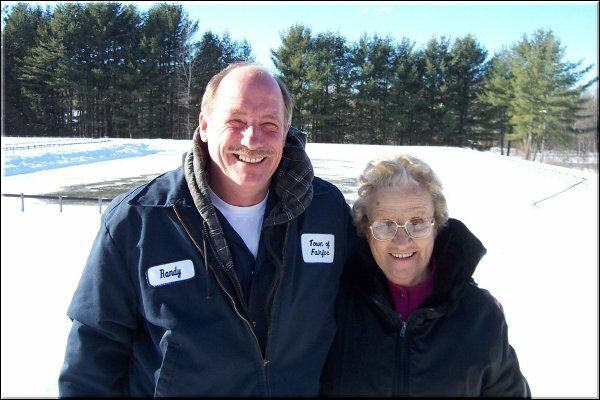 This photo of Randy & Mildred was taken on January 14, 2003 and the temperature was hovering around or just slightly above 0 degrees. Reading water meters in this type of weather is certainly not a fun job, as Randy was headed out with a snow shovel to crawl under a couple of trailers, remove the insulation, read the meters, replace the insulation and return to the many other tasks they both do in the maintenance of the water & waste disposal for the Town of Fairfax.